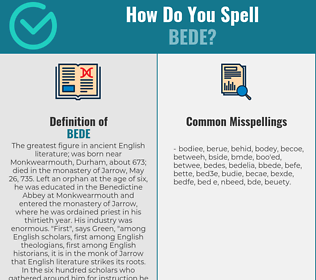 How Do You Spell BEDE? Correct spelling for the English word "bede" is [b_ˈiː_d], [bˈiːd], [bˈiːd]] (IPA phonetic alphabet). Below is the list of 284 misspellings for the word "bede". The greatest figure in ancient English literature; was born near Monkwearmouth, Durham, about 673; died in the monastery of Jarrow, May 26, 735. Left an orphan at the age of six, he was educated in the Benedictine Abbey at Monkwearmouth and entered the monastery of Jarrow, where he was ordained priest in his thirtieth year. His industry was enormous. "First", says Green, "among English scholars, first among English theologians, first among English historians, it is in the monk of Jarrow that English literature strikes its roots. In the six hundred scholars who gathered around him for instruction he is the father of our national education". Bede wrote homilies, lives of saints, hymns, epigrams, works on grammar and chronology, and the great "Ecclesiastical History of England" in five books, gleaned from native chronicles and oral tradition. This was translated from Latin into Anglo-Saxon by King Alfred. The first editions were issued from Strassburg in the 15th century.